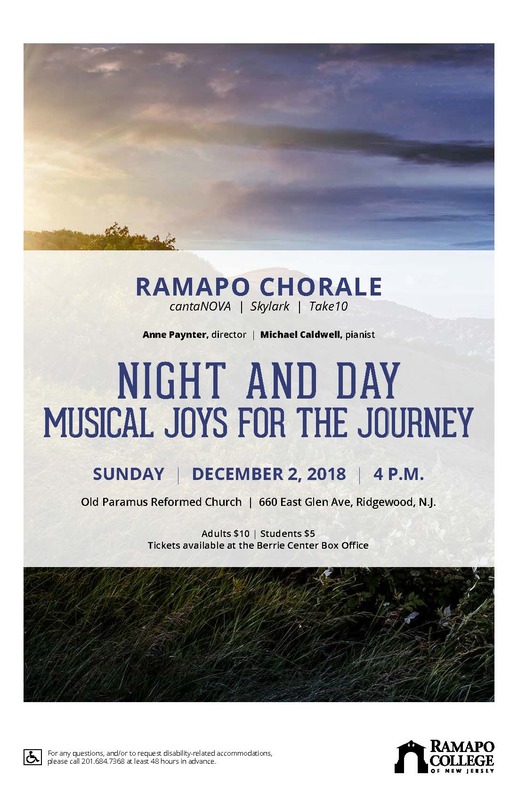 Guest artist Frederick Moyer will perform and discuss a program featuring music of diverse styles, cultures, and time periods-ranging from classical to jazz and contemporary works. Symposium on the effects of streaming on music creativity and the music industry with keynote speaker Liz Pelly. Ms. Pelly is a New York music journalist covering music, culture, streaming and the internet. Her writing has appeared in: Frieze, NPR, Village Voice, Pitchfork, Masimumrocknroll, and The Intercept. 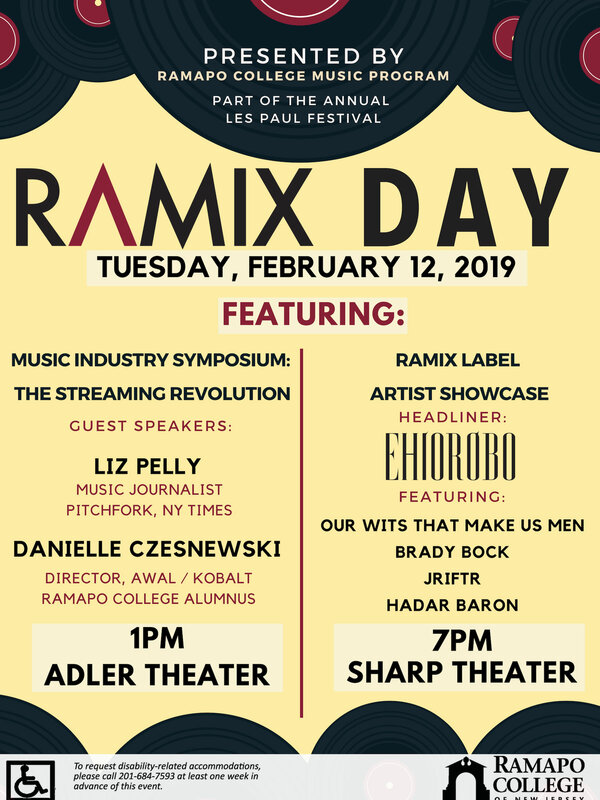 The Ramapo College Music Program is proud to announce the launch of RAMIX Volume 2, the second annual compilation on the college-based independent record label. Ramix Volume 2 will be released on Friday, November 30. 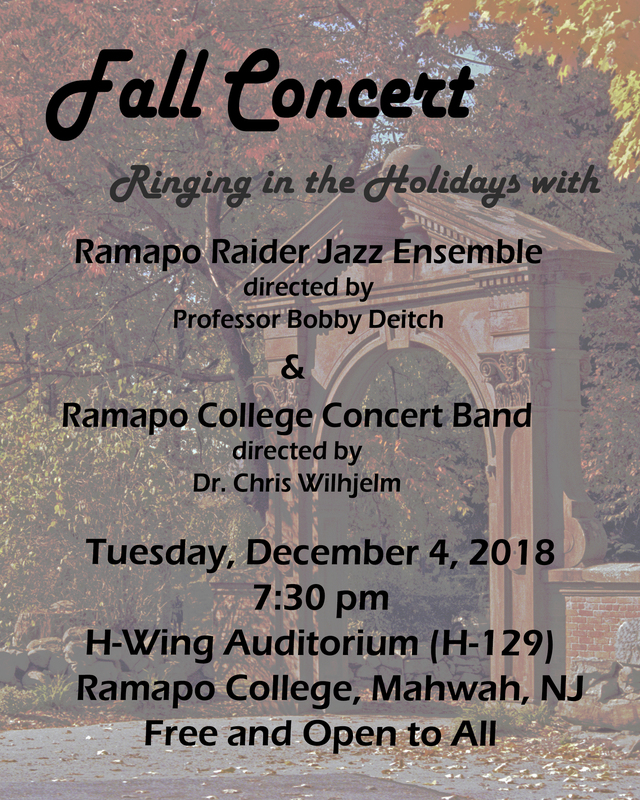 This edition features 10 Ramapo artists and bands who are either current students or alumni of the Music Program. 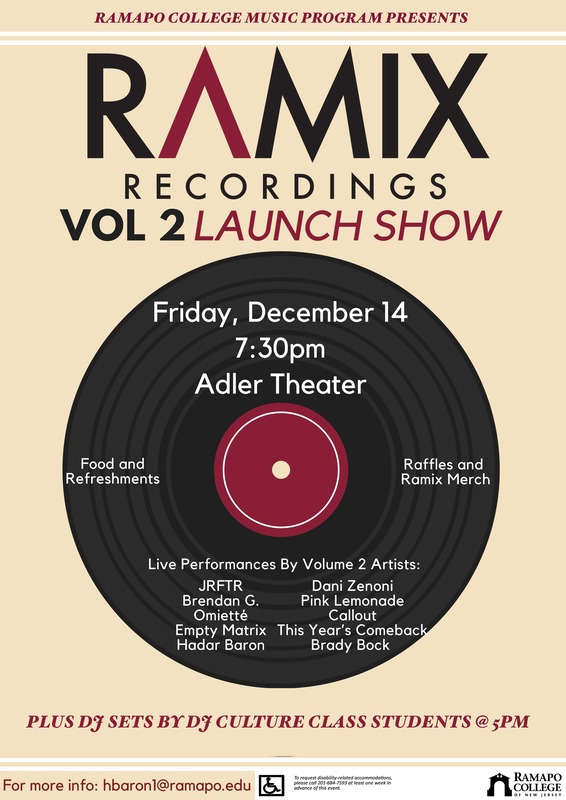 On Friday, December 14 the label artists will perform in the Adler Theater at 7PM to celebrate the launch of the new recording. Current members of the DJ Culture class will be presenting DJ and VJ sets beginning at 5PM and throughout the evening, and free food and drinks will be provided. Featuring Ramapop, final concert of the Advanced Music Performance class, and a short original musical-theater performance of Brady Bock’s independent study. This event is open to students enrolled in Capstone Seminar in Music only. 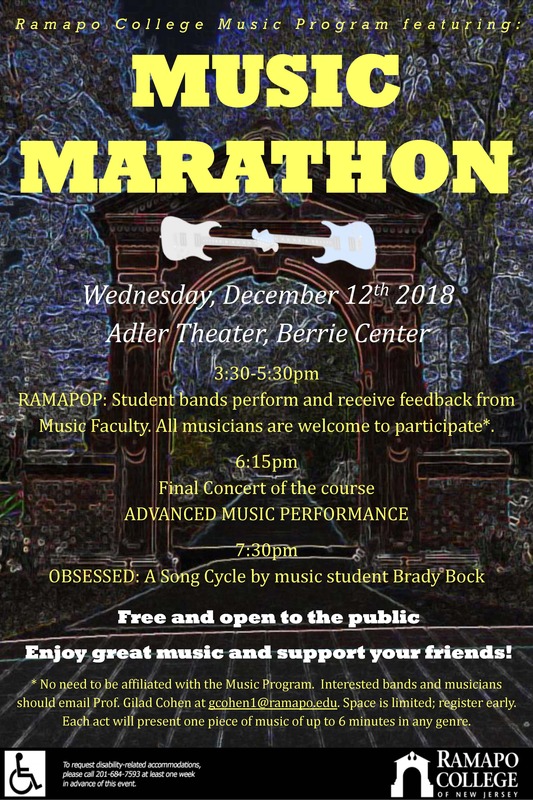 Three recent graduates of the Ramapo Music Program who have successful careers in music will speak to the current seniors about entrepreneurship and career development following college. New-York based, Award-winning concert pianist Benjamin Hochman will discuss issues relating to performance challenges and tools, technique, efficient practicing, interpreting contemporary music, and career decisions, while playing examples from his repertoire, including a pre-premiere performance of Prof. Gilad Cohen’s new piece Circles of Time, supported by Ramapo Faculty Development Fund. The Spanish pianist Mario Prisuelos will present a performance/lecture introducing aspects of the development of Spanish art music from the 18th to the 20th centuries. He will cover stylistic changes from baroque through romantic styles and, more specific to Spain, the influences from Arabic, Jewish Christian and Spanish folkloric musics.